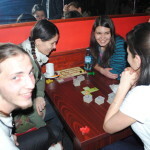 The 7 volunteers from Playride and Science Playgrounds projects had organized two board games evening at bar Montana, in Intorsura Buzaului during their projects in Romania. 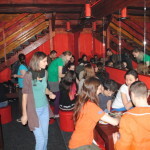 The aim of these events was to offer the young people from Intorsura Buzaului the opportunity to use their evening in the bar in a different, more educative, way. 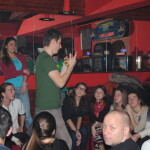 These events create a perfect context for socializing and developing different abilities in the same time. 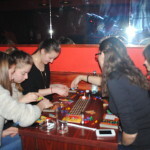 Board games help in developing social abilities, creativity, logical thinking, intelligence and give you the opportunity, in the same time, to spend a nice, funny evening with your friends. 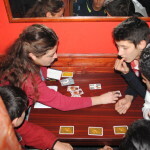 In a relaxing and friendly atmosphere we played more than 10 different games like Saboteur, Train, Ubongo, Gobblet, Mastermind, Werwolves, Carcassone and others, and we enjoyed the company of the people that we’ve knew already in Intorsura, but also other new people that were fascinated by strategy games and funny activities. 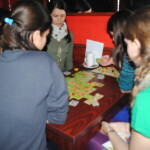 This entry was posted in Board-game-evenings, Serviciul European de Voluntariat. Bookmark the permalink.